As I watch No. 21 SMU Mustangs play the unranked, defending National Champion Connecticut Huskies on this snowy Sunday in Connecticut I can’t help but think about how good this Mustang team would have been if their top recruit decided to go to college. I also can’t help but think about how this talented UConn team is going to miss the NCAA Tournament barring some crazy American Athletic Conference Tournament run, and part of me thinks that winning the conference tournament is very possible (where have we seen a UConn team do that before). The only place where UConn has looked like an NCAA team this season? At the XL Center. And that’s where the AAC Tourney will be played. I’ll save the UConn making-a-crazy-run talk for another time. Southern Methodist will almost certainly be the top seed in that tournament when it starts March 12, but could have been fighting for a top seed in the big dance had it not been for a “unique” situation last summer. While I believe Mudiay did want to help his family financially, I also believe those “eligibility issues” definitely played a part in his decision as well. 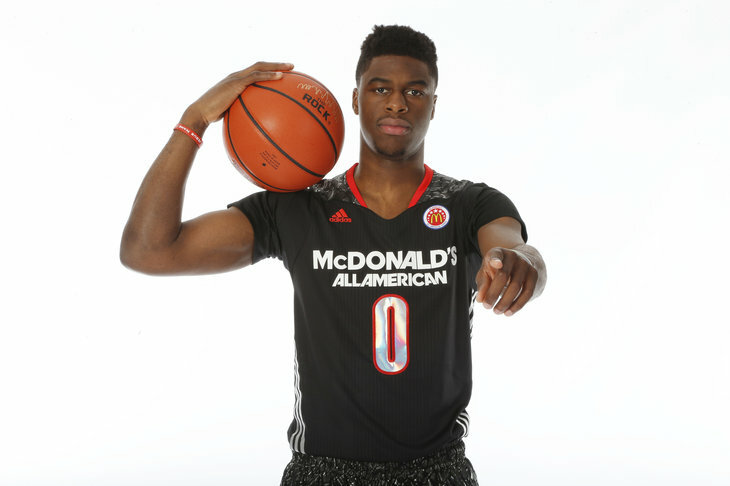 The NCAA Eligibility Center was reportedly looking into concerns over Mudiay having taken improper benefits, making him no longer an amateur. An amateur status is something a player needs to be allowed by the NCAA to play college athletics. I do not know if Mudiay actually did take “improper benefits,” and honesty I don’t care. He decided to completely avoid the eligibility question and become a professional at the age of 18. Mudiay was DraftExpress’s No. 4 ranked prospect, and for good reason; he is a legit 6-foot-5 point guard weighing 196 pounds. I do think the average fan has sort of forgotten about Mudiay when talking about potentially lottery draft picks for next year, but don’t think for one second NBA general managers have. Here is a little highlight video of Mudiay’s game. I usually don’t like basing things off of YouTube highlight tapes because it’s just that: all highlights. The one thing you can take away is the way this young point guard plays, and it is clear parts of his game will translate to the NBA. Mudiay signed a one-year contract with the Guangdong Southern Tigers of the China Basketball Association last summer worth 1.2 million dollars, and made news today after playing in his first game since November 23! Mudiay had 24 pts, 8 rebs, 4 assists, 2 TOs. He shot 6 for 15 from the field and 2 for 4 from 3. While the stat line should be taken with a grain of salt because of the lesser competition it’s against, it is still impressive for an 18-year old who had not played in three-plus months. Chad Ford also mentioned 17 of Mudiay’s 24 points came in the first half of today’s game in which he did not start. The positives scream “NBA Superstar” as the professional game continues to grow into a more spread the floor, open-court, fast-paced style game. The negatives on this 18-year old kid (he was born in 1996!) are all things that can be and almost definitely will be fixed before he turns 25. Needs to hone his skills and he’s turnover prone? No crap, he is supposed to be a freshman in college. Mudiay’s perimeter shooting should improve just as the majority of players’ coming out of college do. The motor comment could be a small red flag, but will definitely not keep a team drafting in the top-5 from drafting him. The NCAA scared another young, talented point guard away ultimately taking one team out of contention of winning the NCAA Tournament this March (the other was Brandon Jennings). As we watch the Madness this March and think about how a lot of these guys will enter this year’s NBA Draft, don’t forget about the super talented point guard playing in China who is watching the Madness right along with us. This entry was posted in Home, March Madness 2015, NCAA and tagged Emmanual Mudiay, ESPN, Huskies, Larry Brown, March Madness, Mustangs, NBA Draft, NCAA, NCAA Tournament, SMU, UConn. Bookmark the permalink.